Playful, wholesome, mystical, practical, vain, altruistic, exclusive, and welcoming—club membership among African Americans in Central Virginia was a complex, powerful, and productive force in both individual lives and the life of the community. The author, working with scores of volunteers from the Legacy Museum, has created a celebration of our need to belong. The Oldest Photo of Lynchburg? 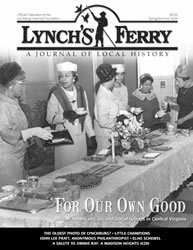 If Lynch’s Ferry had a centerfold, what would it be? Flip to the middle to find out exactly what it takes to get us drooling around here. by J. P. Vaughan, Jr. This intimate, humorous tale takes readers on an “unimaginable quest” from the sandlot into the limelight. Leading the way are coaches with names like “Happy,” “Pop,” and “Pappy” who inspired the sons of mill workers to ignore the insults and focus on the game. by William F. Quillian, Jr.
Elia Heend, a promising rabbinical student growing up in czarist Russia, literally goes beyond the Pale to become a household name in Virginia. The author pieces together the story of his grandfather’s journey from peddling door-to-door to a chain of forty stores. Many photographers like to draw lines around their commercial work, as opposed to their snapshots, as opposed to the artistic challenges they undertake in their spare time. The first is for pay, the second is for fun, and the last is “real”—a true expression of their passion and professionalism. But, as the author points out, in the end it is all a gift.